Apex Motorcycle Boots - ON SALE! Nitro Helmets - Road - ON SALE! Nitro Helmets - Off Road - ON SALE! 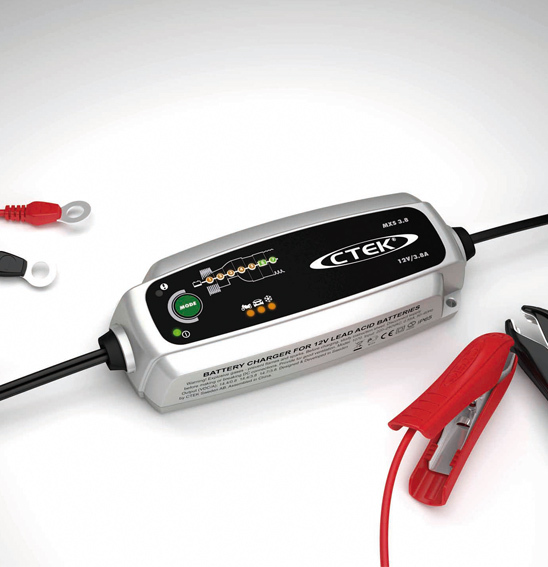 CTEK, manufacturer of the smartest battery chargers in the world, has released their new MXS 3.8 battery charger. An advanced microprocessor controlled battery charger featuring CTEK’s patented float/pulse maintenance mode, the new MXS 3.8 is ideal for 12-volt DC batteries ranging from 1.2Ah up to 85Ah. The MXS 3.8’s unique charging algorithms ensure it can cope with a broad range of battery problems, making it the ideal battery charger for everyday use. Again using patented CTEK technology, the MXS 3.8 comes with a special 7-step charging cycle that includes pulse maintenance. The smart charger also has two output modes: 0.8amp and a full 3.8 amps. Safe and easy to use, the MXS 3.8 will not spark, even when the positive and negative leads are touched or are connected in reverse! This means users can simply connect and safely forget, knowing that the MXS 3.8 will never overcharge or damage the battery. The MXS 3.8 is suitable for a range of vessels and vehicles including trailer boats, jet skis, motorcycles, cars, ride on mowers, and ATVs. Includes Comfort Connect Clamps and Comfort Connect Eyelet M6. © 2016 Forbes and Davies. All rights reserved.